UWI’s Stephen Katwaroo is bowled in USA Combined Universities yesterday, at the Sir Frank Worrell Ground, St Augustine. 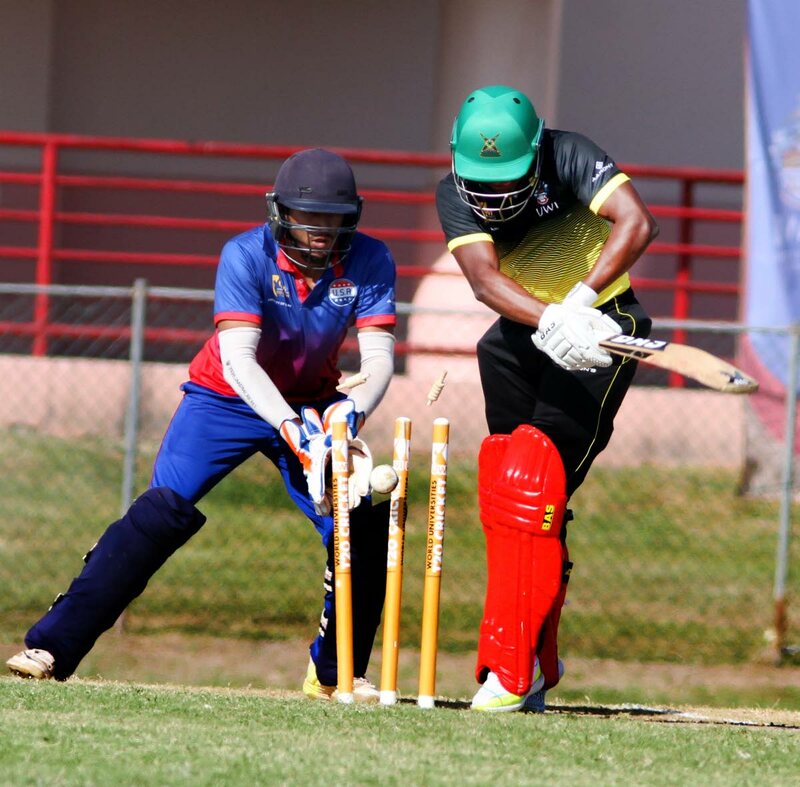 HOSTS UWI (University of the West Indies) made it two wins out of two with an easy 38-run win over the USA Combined Universities team yesterday afternoon in the inaugural UWI World Universities T20 Cricket Tournament. USA won the toss and chose to field at the Sir Frank Worrell Ground, St Augustine, only to see UWI rack up 177 for four in their allotted 20. When the American students batted, they were only able to reach 139 for six in their quota. 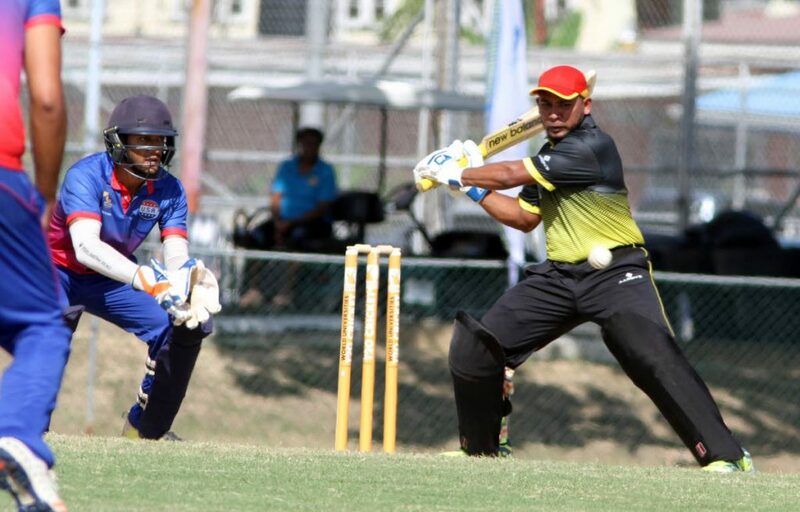 UWI got off to a rapid start thanks to openers Adrian Ali and Sachin Seecharan. They put on 101 with Ali making the tournament's highest individual score so far with 72 off 45 balls. He cracked five fours and four sixes while Seecharan made 36 from 35 with four fours. When Seecharan was run out, national player Steven Katwaroo entered the fray and made 19 (two fours) before Ali was out leg-before to Wahidur Rahman. UWI’s opening batsman Adrian Ali plays a shot against USA Combined Universities yesterday, at the Sir Frank Worrell Ground, St Augustine. Raymond Bynoe then removed Cameron Pennyfeather for two and uprooted Katwaroo's stumps to leave UWI at 144 for four in the 18th. Rachad Forde (22 not out with two fours, one six) and Al Small (15) would then embark on a 33-run partnership to take the hosts to the tournament's highest team score. Bynoe ended with two for 31 from his four overs. When USA batted they fared much better than the night before when they were bowled out for 89. Opener Derick Patel impressed yet again with a quickfire 18 off 11 (three fours, one six) before national player and UWI skipper Marlon Richards bowled him. Fellow opener Sagar Patel (21) and Kishan Dass (13) took the score to 54, only for Pennyfeather to remove both in quick succession. Dass skied to Michael Frew in the deep while Patel went LBW. Small then caught and bowled captain Abhijai Mansingh (13) and had Ram Vishwanathan (eight) lobbing to Gillion Tyson, leaving USA on 86 for five in the 15th. Karthk Gattepalli would enter and make a brisk 32 off 22 (three fours, one six) while Kyle Phillip blazed 18 off eight (two fours, one six) but it would not be enough as USA lost one more wicket to end on 139; a drastic improvement but one UWI easily handled. Small finished as their best bowler with two for 17 while Pennyfeather's pair of scalps cost 22. UWI will close out the group stage against Oxford and CCC while USA will face TSATT and Oxford when action resumes January 15. UWI 177/4 (Adrian Ali 72, Sachin Seecharan 36, Raymond Bynoe 2/31) vs. USA 139/6 (Karthk Gattepalli 32 not out, Sagar Patel 21, Derick Narine 18, Al Small 2/17, Cameron Pennyfeather 2/22). UWI won by 38 runs. Reply to "UWI maintain perfect start after 38-run win vs USA"